For decades, Rick Gould and the Gould+Partners team have been a key source of insight for agencies in the public relations industry. We are constantly gathering and evaluating relevant statistics and information, compiling our findings and sharing our conclusions with our clients. By sharing our specialized knowledge, we help to keep the PR industry moving forward. We are proud to have established ourselves as a trusted resource for public relations firms and creative service agencies, and will continue to do our best to make our industry insight available and accessible to those interested in utilizing it. Here, we invite you to browse our various publications related to PR mergers and acquisitions and financial management. This how-to book provides In-depth guidance for how PR agency owners can boost their profitability, enhance their value and execute a successful sale. 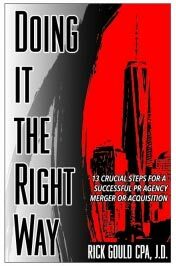 Gould shares a wealth of M&A tips and offers several checklists designed to guide owners through the entire process of selling a PR agency. The book will be officially released in May and will be available via Amazon.com. Net proceeds from this edition of the book will be donated to The Hole in the Wall Gang Camp. New & improved guide reveals how to increase the profitability of your PR agency by using updated benchmarks and ratios. 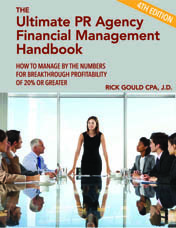 Gould gives you steps to immediately take to start managing your firm smarter to achieve maximum profits.